Whether it’s to pursue a passion, realize a lifelong dream, or get away from the confines of an office starting a business is both rewarding and fulfilling. You are your own boss and learn loads of stuff you may not encounter in a corporate setting. You need a lot of resources to set up your business and keep it running. Aside from funds, you need to dedicate a lot of time and energy to make your venture a success. This includes business insurance. There are so many things to take into account when starting a business. And business insurance is one of them. You may think entrepreneurs don’t have to be told to buy policies. But some see it as an extra expense so they don’t bother. At least not at first. You’ve probably spent a lot of money to buy equipment and supplies, hire staff, and process documents. And adding another cost via premiums surely isn’t good news. But the reality is, it’s a wise investment. There is a need to change the mindset. See it as something that can help you in ways you may not know about. Business insurance can pave the way for your success. How? Here are five ways that can help new businesses become more profitable. No one wants to make transactions with a business that doesn’t look legitimate. 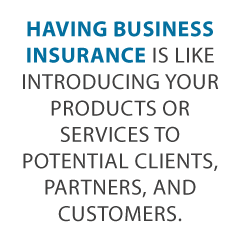 Having business insurance is like introducing your products or services to potential clients, partners, and customers. Being new in the industry means nobody knows you yet. But with business insurance, you show you have the funds or resources to keep the operations running smoothly. And you show you know what you’re doing. And you have something to rely on in case something unfortunate happens. Regardless of industry, starting a business is not always roses and sunshine. It’s a risky endeavor. But, if you have business insurance, it shows you are protecting the business from huge financial losses. Also, some people who may want to invest in or be part of your business will require Professional Liability coverage to ensure their assets are protected. Carrying insurance builds your business’ credibility. You may have seen some businesses that have the sign “licensed, bonded, and insured” in their vehicles or signages. That’s because it helps in making your business look credible – it shows potential customers and clients that if something goes wrong when they make transactions with you, there’s a way for them to be compensated. It builds trust. And when people trust your business, revenues will soon come in. Just imagine what a simple act of buying coverage can do for you. Your state may likewise have rules and regulations about what insurance policies businesses should have. Those who are in construction or healthcare industries may be required to have insurance so they can obtain their licenses. Depending on the state you’re in, you may be required to purchase one or more types of coverage. Otherwise, you may face penalties or be excluded from public contracts. In other words, not carrying insurance required by the law will cost you more harm than good. You might as well buy adequate coverage. Discover our business credit and finance guide, jam-packed with new ways to finance your business without emptying your wallet. No one wants to face untoward incidents. But in the world of business these happen. A complaint or lawsuit can be due to bodily injury sustained by a customer or employee. It can also be damage to property. A lawsuit can mean leaving a huge dent to your wallet. This is because of the legal fees, settlement costs, and other expenses. What’s worse? One accident or disgruntled worker and your business can fold. It’s the reality all entrepreneurs must deal with. But, if you have business insurance, your savings will be protected. Your business may need more than one type of coverage. To save some cash on the premiums, you may want to consider purchasing a Business Owner’s Policy instead. It is a combination of two insurance products: Commercial Property and General Liability insurance, making your premiums lower. The business owner’s policy, also called BOP, can protect a business against significant financial losses after a major incident. How? If you have BOP and have lost income due to stoppage of operations, the insurer will pay what your business would have earned while it is not operational. The coverage will also take care of the usual operational costs. So these include rent and utilities you would have incurred during that period. Some businesses prefer just to cover lost income. But there are policies that also protect employee salaries for up to a year. Starting a business comes with the goal of earning money for yourself and loved ones. But you can’t if there’s a lawsuit, or you need to replace damaged equipment or do repair work on your property. This is why buying business insurance is essential. It serves as a security blanket. So you don’t have to spend a lot of money on settlements and legal fees – money intended for your family. Having coverage will not prevent accidents or any unfortunate incidents. Yet it surely can help you during those trying times. When your business is covered, money to pay the legal and medical fees will be one less thing to worry about. No matter what the nature of your business is, it surely uses some sort of equipment for your day-to-day operations. In many cases, business equipment can be expensive. What if it gets damaged because of a fire or natural disasters? What if it gets stolen? Replacing it at the soonest possible time will not be cheap. Protect your equipment by purchasing business insurance. It’s one of the things you need to do to make sure you can keep running without a glitch. You also don’t have to shell out a lot of money if your business equipment has adequate insurance. If you operate your business at home, your existing homeowners’ policy will not be enough to cover your operations. So, make sure to get separate insurance to cover any claims due to damages to your equipment. Commercial property owners are also aware of the potential risks involved in a business. That’s why they take precautionary measures whenever there are business owners who wish to rent a space. They may ask if you have General Liability insurance and to include them in the coverage. This is an “additional insured” and is meant to protect them from any lawsuit against your business. For instance, if someone sustains a bodily injury within your business, the affected individual may file a case. So it would be not only against you but also the owner of the commercial space. But if you carry insurance, you can also protect the owner from financial losses. When it comes to additional insureds, it may not only apply to commercial space owners. Your investors, partners or clients may also ask you to be included in the business insurance for their own protection. No one can predict what’s going to happen in the future. Earthquakes, fires, flooding, and other natural disasters can occur when you least expect it. In the world of business, an employee may slip and fall. Your equipment may break down and halt all operations. A dissatisfied customer may file a complaint. Your delivery vehicle may be involved in an accident. A thunderstorm may bring some sort of damage to your business property. With all of these risks, there’s no reason not to carry adequate insurance. Indeed, business insurance offers a lot of benefits to help make your business a success. The world of insurance may be a lot to take in. So it’s best to seek professional guidance from a reputable insurance provider. They can assess possible risks and recommend the types of coverage your business would need. You can also do your research. And compare quotes from a few insurers to make a more informed decision. In this digital age, you can find tons of information from reputable websites that can help you to decide. And ask fellow entrepreneurs about their experience with their own coverage. Even family and friends can help you decide on which types of insurance products to consider. With the right business insurance policies, you can have peace of mind. You have something to depend on when something unfortunate happens. You can then concentrate on what you need to do. And that is to make sure your business is running smoothly and make it productive and profitable.